For a long time, paleontology has contributed to the understanding of global change by studying the history of life. We take this mission seriously and help develop the ‘Global Change Paleobiology’ research field through application of knowledge about Earth’s history. This is used to improve prediction of developments in the biosphere given the current changing climate. 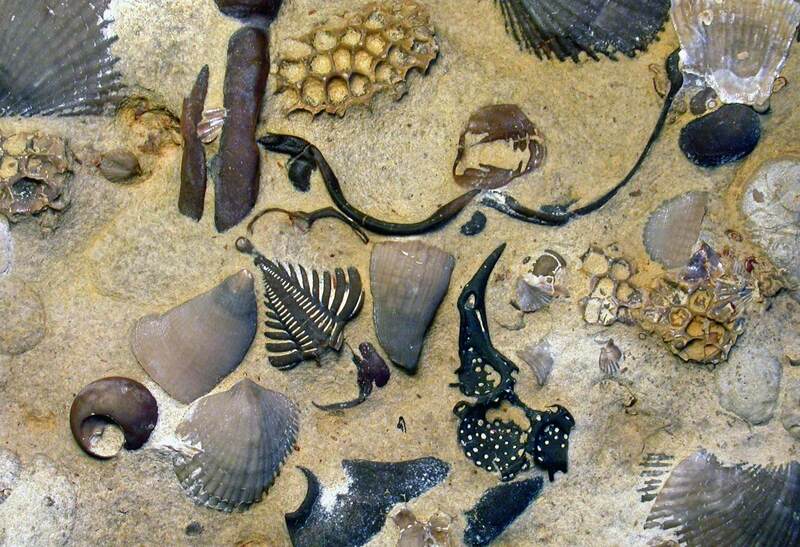 Global Change Palaeobiology interprets the response of organisms and ecosystems had to environmental changes in the past, placing emphasis on changes in climate seawater chemistry. This topic is related to the new field of Conservation Palaeobiology, but is broader in that it studies deep time in addition to the recent past. It studies patterns on both regional and global scales, and is interdisciplinary through the merging of ecology and evolution. The current rate of global warming is probably unprecedented even on geological time scales. Yet in terms of magnitude the geological record offers many examples when the magnitude of warming exceeded that of today. One example is in the Pleistocene ice age, where several episodes of rapid warming, known as interglacials, led to global temperatures exceeding those of today and the near future. Reef corals responded to these warming episodes by migrating towards the poles. Not only did they expand their poleward range limits but they also retracted their equatorward range limits such that biodiversity in the core tropics was strongly depressed (Kiessling et al. 2012). This leads us to expect that current global warming will soon lead to a severe decline of reef coral diversity near the equator. In a joint research project with the University of Queensland we study the ecology and biodiversity of equatorial reefs of the last interglacial (ca. 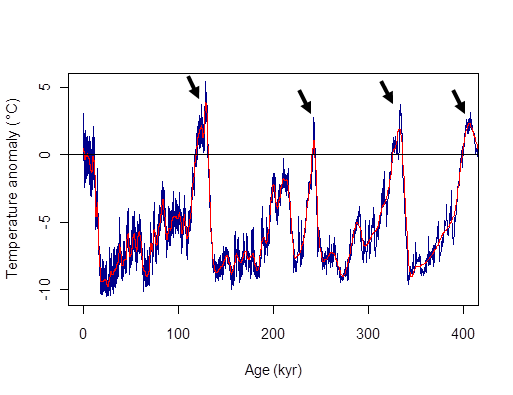 125 kyr) to learn more about the consequences of the warming pulse some 130.000 year ago. Jouzel J, et al. (2007) Orbital and millennial Antarctic climate variability over the past 800,000 years. Science 317:793-796. 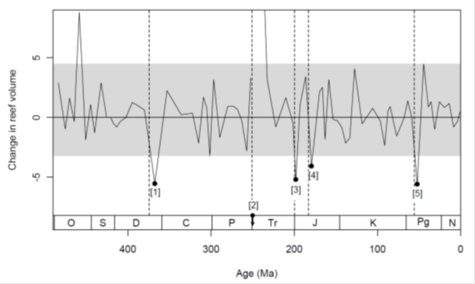 Kiessling W, Simpson C, Beck B, Mewis H, & Pandolfi JM (2012) Equatorial decline of reef corals during the last Pleistocene interglacial. PNAS 109:21378-21383. Figure: Polar temperature anomalies of the last 400 thousand years, reconstructed from ice core data in Antarctica (Jouzel et al. 2007). The arrows point to distinct interglacials when temperatures exceeded those of today. Corals reefs are thought to be especially sensitive to climate change and ocean acidification, yet reefal ecosystems have persisted over several 100 million years in spite of extreme environmental upheavals (Kiessling 2009). However, reefs have experienced severe crises in their Phanerozoic history and we need to learn more about the causes and consequences of these ancient reef crises to understand the potential of coral reefs to respond to climate change. We develop new metrics for assessing reef crises in deep time, compare the temporal fit of reef crises and mass extinctions and use a large suite of approaches to assess the potential causes and ecological consequences of reef crises. We also struggle to find intrinsic factors that may help to protect reefs from collapse. Kiessling W & Simpson C (2011) On the potential for ocean acidification to be a general cause of ancient reef crises. Global Change Biology 17:56-67. Figure: The five major metazoan reef crises in the last 450 million years. Only three significant reef crises correspond to episodes of traditional marine mass extinctions (from Kiessling & Simpson 2011). Current global warming and ocean acidification has severe consequences for marine life. Species can either adapt, migrate to escape the heat, or become extinct. There is still much discussion on the adaptability of recent species. The time scales over which the response of organisms is observed may simply be too short for a reliable assessment. Using the fossil record, we assess the potential of marine organisms to change their ecological preferences during times of global change. In an ongoing project we evaluate the patterns of shifting habitat preferences. Opens external link in new windowWe find that once significant preferences for a specific habitat have evolved, these are very unlikely to change. Further research will focus on a finer temporal and spatial resolution to allow more explicit statements. Paleontologists can assess extinction rates and their selectivity directly, without relying on inferences of extinction risk as used in the Opens external link in new windowIUCN Red List. We use the fossil record to extract factors that determine the risk of extinction. We evaluate organismic traits and species-level traits. Organismic traits such as life habit, skeletal mineralogy, feeding mode, and fecundity allow us to derive general risks, which largely agree with neontological findings. Species-level traits such as population size and geographic range allow more specific predictions. 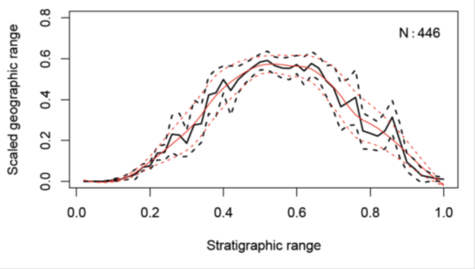 Species and genera tend to increase their geographic range until about the midpoint of their stratigraphic range after which they gradually lose geographic range until final extinction. We can use this pattern to predict the time of extinction of extant genera given that they have already exceeded their maximum geographic range. Ongoing work tries focuses on a finer taxonomic and stratigraphic resolution for this approach. Tietje M & Kiessling W (2013) Predicting extinction from fossil trajectories of geographical ranges in benthic marine molluscs. Journal of Biogeography 10.1111/jbi.12030. The scaled geographic range of post-Paleozoic marine bivalve genera over their scaled stratigraphic range. The pattern of a symmetric waxing and waning of taxa can be used to predict the time of extinction of recent species (from Tietje & Kiessling, 2013).